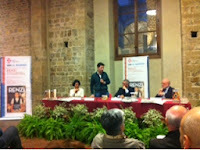 Last night, thanks to a Tweet from Palazzo Vecchio, I received an announcement that the Comune di Firenze, in collaboration with La Nazione, would host a press conference this evening in la Sala d'Arme, presenting the hot-off-the-press book "Renzi", the story of Matteo Renzi's life from school boy to Presidente del Consiglio, from the perspective of the press through writings of journalists over the years. Presentation to be executed by Director of "La Nazione" Gabriele Cane', our new mayor Dario Nardella, and attended by political celebrities, international press and various Florentine die-hard Renziani. Arriving well in advance, I was delighted to meet and converse with the elegant Marta Taddei, a pure-bred Florentine with whom I shared conversation until the conference began, and then, sitting together for the presentation, she whispered to me, explaining various double-entendres and Florentinisms that were thrown around on the dais. It is intriguing to have the opportunity to interact with age-old Florentines who reveal to me and share precious perspectives and tidbits of Florentine history that I would not otherwise have the opportunity to learn. Carina e preciosa! My life as a dual citizen who only 5 years ago made Italy my home has been exponentially enriched by becoming involved in the very core of the community. Fortuitously indeed. Part of which includes attending important yet intimate events such as this, which are so passionately attended by an audience of seriously dedicated Florentines. I've learned more from these community forums and through volunteer organizations such as "Angeli del Bello" than from any other source, book or school. In this city, brimming with tourists and overwhelmed by a large transient community, it can be a challenge to keep attached to the city's true roots as it is so easy to become diverted by the glamour and drama of the city's constant array of well-publicizied and sometimes bombastic cultural events. The conference was attended by 200 people or so, clearly all of which were long-term Florentine devotees, which gave me the opportunity to mingle among fellow Florentines in this "little big" city, both before and after, and to rub shoulders with the likes of Dario Nardella. As a souvenir of the occasion, "La Nazione" distributed a first page of the first-ever published issue of the first national newspaper in Italy, printed on July 19, 1859. The Renzi book was distributed in small quantity only to distinguished political guests, (I was defeated in my attempt to grab one) but today I am bound for La Fetrinelli to buy my personal copy. What a stroke of divine luck to have settled in Italy during an era of dramatic political change, and to have experienced my first opportunity to vote as a citizen in the primaries last year. It's been exciting to experience Italian politics first-hand through my exposure to local politics and the rise of Renzi as a mayor who was so involved in our community, who rode his bicycle around town and who sprinted ahead to become the rising star and "man of the moment" in Italian politics...the person who the world is betting on to help pull Italy out of its deeply rooted problems. I'm going to miss him here in Florence. He may not have been liked by all, but he certainly had a strong omnipresence in our community and possessed a unique ability to make us feel connected and proud of our Florence. I hope he does the same for Italy.